How To Make Power Audio amplifier 2. 1 (2 Front + 1 Subwoofer) , Power Audio amplifier 2. 1 is a circuit schematic of active speakers that can be used to amplify the voice signal from a single source ( PC, MP3 Player or Phone). Power Audio amplifier circuit schematic 2. 1 (2 Front + 1 Subwoofer) that has two channel outputs / output front speakers and 1 subwoofer speaker unit. Power Audio amplifier circuit schematic 2. 1 are built wearing power audio amplifier IC TDA1521 for all its channels. The output power which could be obtained from the Scheme of Power Audio amplifier circuit 2. 1 (2 Front + 1 Subwoofer) is 24 Watt stereo for front chanel and 24 Watts for the subwoofer channel. Power Audio amplifier 2. 1 (2 Front + 1 Subwoofer) can be used in the area of the room or work area as a signal amplifier that hifi quality sound. To make the Power Audio amplifier 2. 1 (2 Front + 1 Subwoofer) can be listened are circuit schematic drawings with supporting components on a circuit schematic drawings below. Audio amplifier circuit schematic role is to amplify the sound signal for a stereo channel front. Scheme audio amplifier circuit comprising the two sides of the front of the mouth in the wake amplifier IC TL072 wearing. 4558 & audio power amplifier circuit schematic that in the wake wearing as power IC TDA1521 stereo amplifeir. 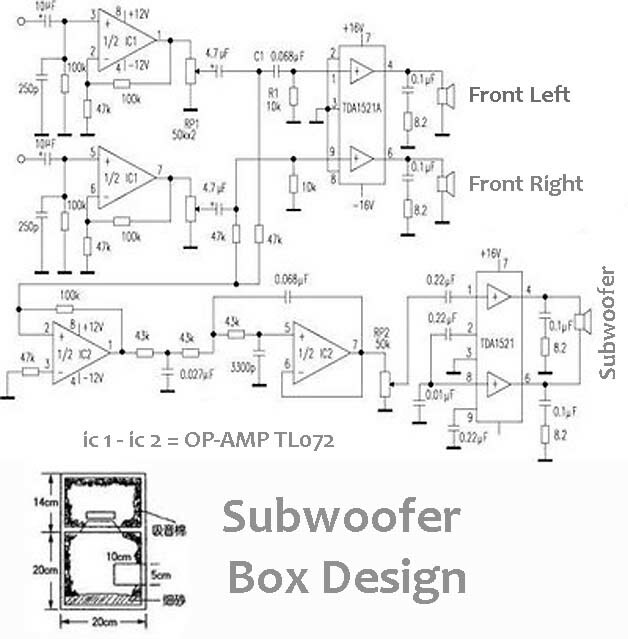 Subwoofer audio amplifier circuit schematic role is to amplify the sound signal sounds super bass (subwoofer). 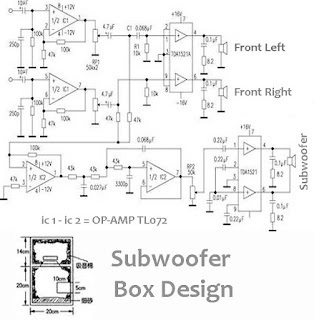 are circuit scheme is divided into two sides of the low-noise filter (super bass) who in the wake of the second unit in the operational amplifier IC TL072 / RC4558 ( or you can using this circuit Subwoofer Booster 4558 ) and hand power audio amplifier with TDA1521 IC which are configured by bridge to drive the subwoofer speaker. you can use accoustic generator filter/ active crossover see makibg home theater amplifier, in there you can find it.